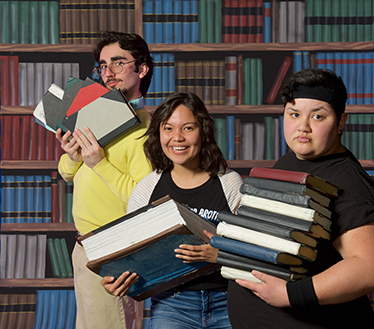 January 29, 2019, Santa Rosa—The Santa Rosa Junior College (SRJC) Theatre Arts Department presents “All the Great Books (Abridged),” a play written by Reed Martin and Austin Tichenor that presents brief, comedic renditions of the works of great writers and thinkers, like Confucius, Thoreau, Swift and more. The play has been described as a literary canon that explodes as director and playwright Reed Martin and the cast take attendees on a ninety-eight-minute roller-coaster ride through all the great books…abridged! Reed Martin, author, director and managing partner of the Reduced Shakespeare Company (RSC), has adapted this RSC hit to be performed by an ensemble of 12 SRJC theatre arts students. Reed has written for the BBC, NPR, Britain's Channel Four, RTE Ireland, Public Radio International, Washington Post, and Vogue. He has been on all the major television networks and has performed twice at the White House, as well as in forty-six states and eleven foreign countries. Prior to joining the RSC, Martin spent two years as a clown and assistant ringmaster with Ringling Brothers' Barnum & Bailey Circus, time that he says he spent frightening children and smelling of elephants. The show is recommended for ages 13 and above and will be shown on select dates March 8-17 in Newman Auditorium on the Santa Rosa campus. March 8, 9, 13, 14, 15, 16 at 8:00 p.m.
March 10, 16, 17 at 2:00 p.m.
Tickets are available for purchase online at https://theatrearts.santarosa.edu/buy-tickets-online-0 and at the SRJC’s Theatre Box Office at (707) 527-4307. 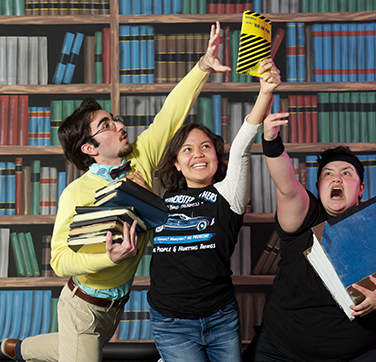 Photo credit – Jasmine Flores-Nunez, Christopher Shayota, and Alexx Valdez; Photo by Thomas Chown.